The behavior of the Justices during oral argument has always fascinated Supreme Court watchers. Recent studies have confirmed what experienced observers have long known: Justice Breyer talks the most, Justice Thomas says the least, and Justice Scalia gets the most laughs. What has remained somewhat of a mystery, however, is how much the Justices continue to think about oral argument after they leave the courtroom and return to their chambers. Which Justices give oral argument the most consideration? Which statements by advocates make the most lasting impressions? The Justices’ own opinions are as good a place as any to start looking for answers. The very purpose of oral argument is to influence how the Justices decide cases. If something said at oral argument strikes a Justice as particularly noteworthy, one would think it would show up in the Justice’s opinion. So, too, if a Justice considers oral argument an especially helpful source of information, one would think the Justice would reference it often. Thankfully, references to oral argument are clearly marked in the Justices’ opinions by citations of the transcript released after each case is heard. To get an accurate picture of the Justices’ practices, I examined every citation of the transcript of oral argument made between the start of the 1994 Term, Justice Breyer’s first, and the end of the 2007 Term, the Court’s most recent. In the roughly 2600 opinions written during this fourteen-year span, there were 787 citations of the transcript. For each one, I noted the type of opinion in which the citation appeared, the Justice who wrote the opinion, the Justice’s reason for citing the transcript, the identity of the speaker cited, and the party who won the case. 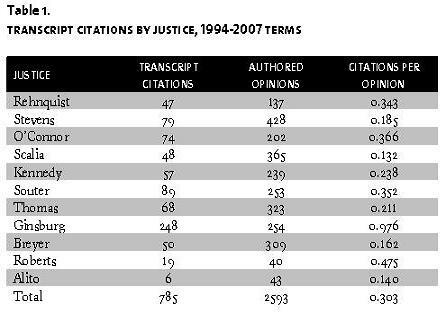 As shown in Table 1, the data leave no doubt which Justice references oral argument the most. Accounting for nearly a third of the total citations by the Court as a whole, Justice Ginsburg cited the transcript a staggering 248 times—almost once per opinion. In absolute numbers, Justice Souter came in a distant second, with eighty-nine citations, followed by Justice Stevens, with seventy-nine. The order behind Justice Ginsburg changes dramatically, however, when one considers instead the rate of citations per opinion. Chief Justice Roberts catapults to second place, averaging about one citation for every two opinions. Given that both were distinguished Supreme Court advocates before joining the bench, it is perhaps no coincidence that Justice Ginsburg and Chief Justice Roberts reference oral argument so frequently. Which Justice cites the transcript least often? Based on how rarely he asks questions, one might guess Justice Thomas. One would be wrong. Justice Thomas’s silence should not be confused with indifference; the fact that he referenced oral argument sixty-eight times at a rate of 0.211 citations per opinion shows that he is listening. Ironically, the most active Justices during oral argument are among the least likely to cite the transcript: Justice Breyer’s fifty citations at a rate of 0.162 per opinion place him near the bottom of the list, while Justice Scalia’s forty-eight citations at a rate of 0.132 per opinion put him dead last. Justice Scalia’s numbers are consistent with the theory that he considers oral argument not so much a chance to be persuaded by what he hears as “a chance to drive home his points by exposing weaknesses in a lawyer’s position.” Indeed, despite being the Justice who cited the transcript the least, he was the Justice whose own words at oral argument were cited the most: eleven times in all, seven times by his longtime friend, Justice Ginsburg. As exciting as it is to be quoted in the United States Reports, oral advocates should not be too happy to find their own words in an opinion. As shown in Table 2, the Justices were nearly twice as likely to cite an advocate whose side they opposed than one whose side they supported. Moreover, as shown in Table 3, losing advocates were cited significantly more often than winning advocates. These numbers indicate that oral argument is indeed what Justice Ginsburg calls “a hold-the-line operation”: “Not many cases . . . are won on the oral argument alone, but a case can be lost if a lawyer is unable or unwilling to answer a justice’s question honestly and persuasively.”If Justices are umpires, then oral advocates are closers—pitchers who enter a game in the late innings to protect their team’s lead. The best they can hope for is to get the save; the worst that can happen is that they lose the game. We should not be too quick to draw conclusions about the role of oral argument at the Supreme Court based solely on the data of this study. After all, citation counts can only show so much. The Justices might be thinking about oral argument without citing the transcript. Something an advocate said might make a difference and yet not make its way into an opinion. Still, we improve our understanding of how the Justices operate by knowing how often, and for what reasons, they cite the transcript of oral argument. Such information should interest not only the observer in the audience, but also the oral advocate at the lectern. Click here for an audio recording of this piece . Please note that the recorded version does not include data from 2007, which is reflected in the text above. Frederick Liu is a recent graduate of The Yale Law School. Preferred Citation: Frederick Liu, Citing the Transcript of Oral Argument: Which Justices Do It and Why, 118 Yale L.J. Pocket Part 32 (2008), http://yalelawjournal.org/forum/citing-the-transcript-of-oral-argument-which-justices-do-it-and-why.